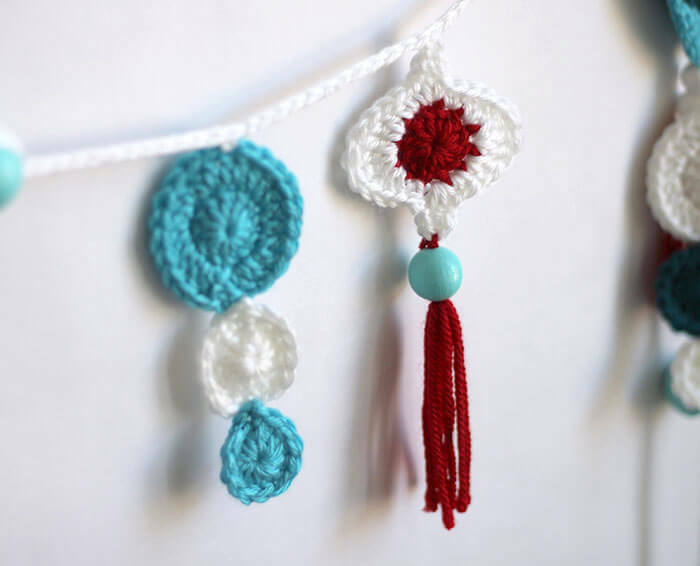 Crocheted retro Christmas ornaments team up with colorful wooden beads to make a very merry garland. Free crochet pattern and instructions. This post includes affiliate links. If you click through and make a purchase, I may make a small commission at no extra cost to you. Thank you for supporting Persia Lou! Who’s ready for some more festive crocheting? Tis the season for holiday crafting, am I right? For today’s post, I’ve teamed up with Simplicity, Boye Yarn Crafts, Soak Wash and some of my favorite crochet bloggers. 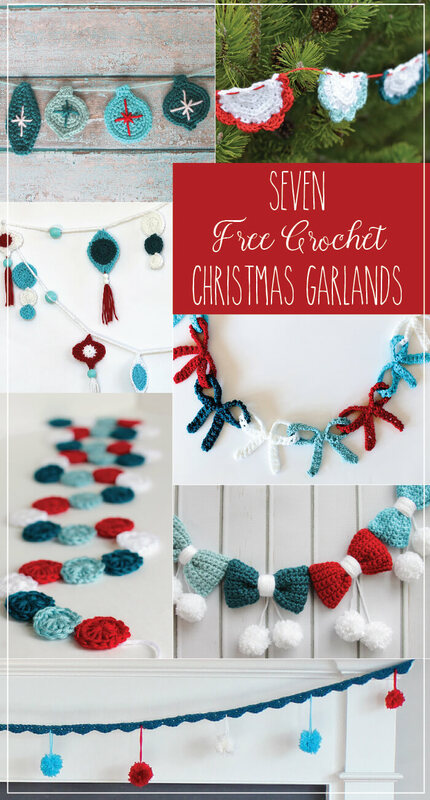 We will each be sharing a free garland pattern every day this week. 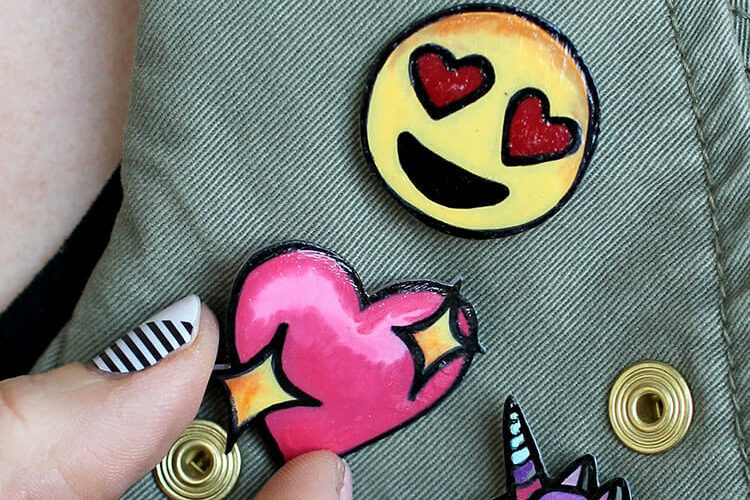 PLUS there is a great giveaway at the end of this post! Wahoo! 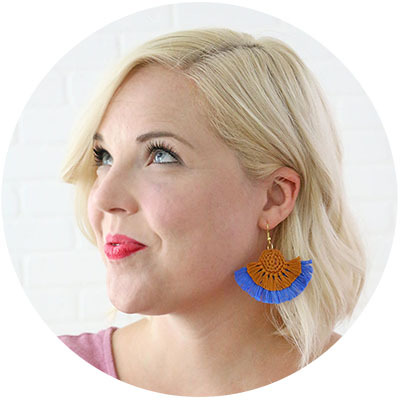 Keep on scrolling to see the other garland patterns and to enter the awesome giveaway. You aren’t going to want to miss it! But first, let’s check out my garland, yes? I made three different styles of ornaments for my garland. 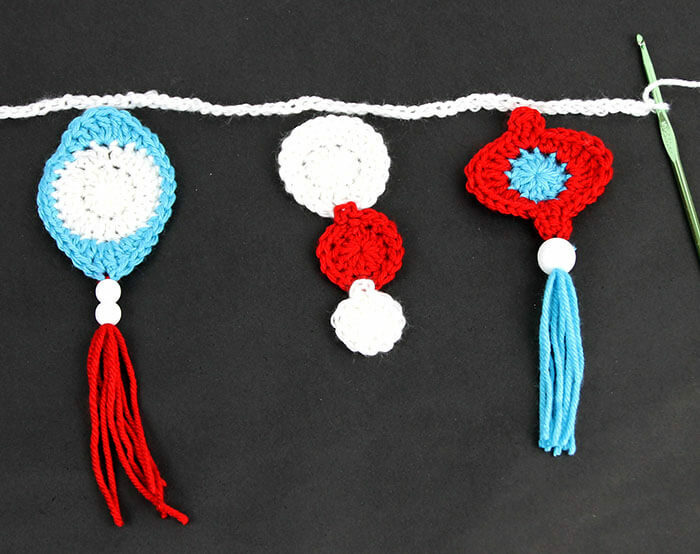 Each has it’s own pattern below, but before you start crocheting, you need to paint the wooden beads the color of your choice. I used white and aqua colored beads. 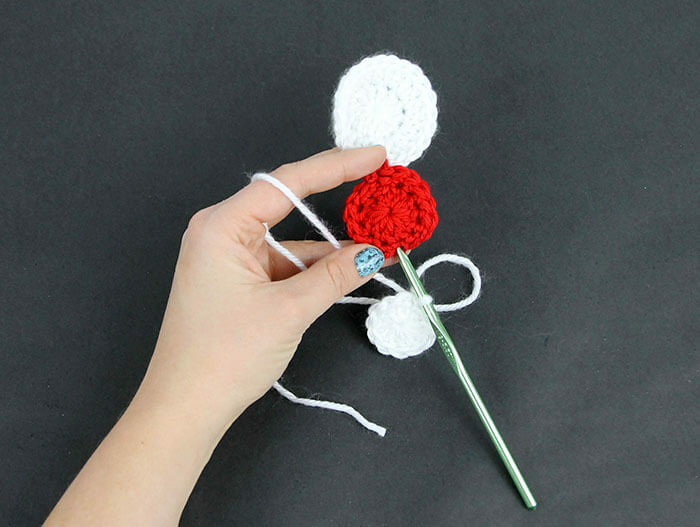 Half-Treble Crochet (htrc) – Yarn over twice, insert hook into work, yarn over (four loops on hook), yarn over and draw through two loops (three loops on hook), yarn over and draw through all loops. Round 1: Start with a magic loop, ch 3 and work 11 dc in the magic loop. Pull tail to tighten circle, slip stitch to join. Finish off weave in ends. Round 2: Join new color, ch 1, (sc, ch 2, trc, ch 2, sc) all in same stitch, *2 hdc in next st, (dc, htrc) in next st, 3 trc in next st, (htrc, dc) in next st, 2 hdc in next st,** (sc, ch 2, trc, ch 2, sc) all in next st, repeat from * to **, sl st to join. Finish off and weave in ends. 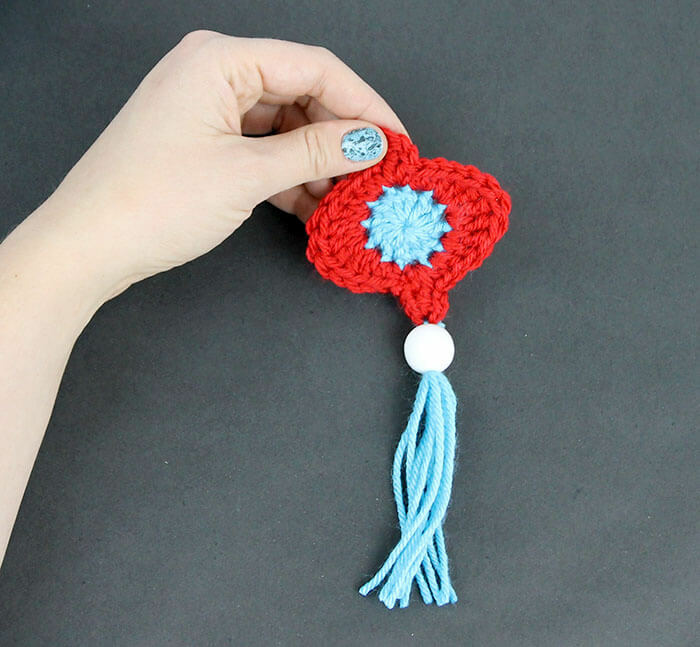 Next we will attach a little tassel to the bottom of the ornament. 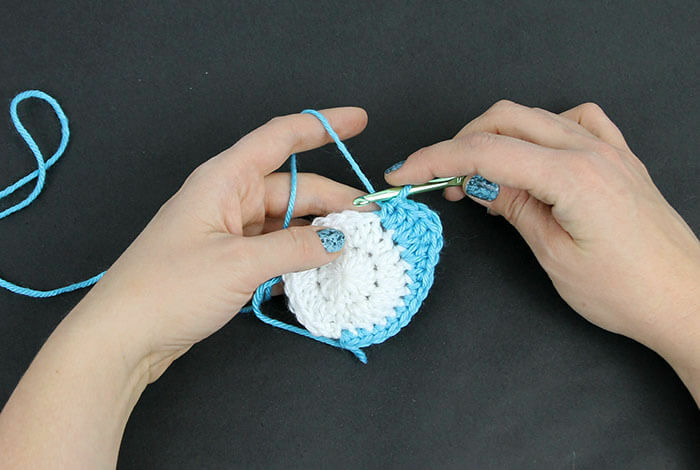 Start by wrapping the yarn around your fingers four or five times. Cut off a length of yarn, thread through the top of the loops you just made and double knot it. Cut through the bottom of the loops. 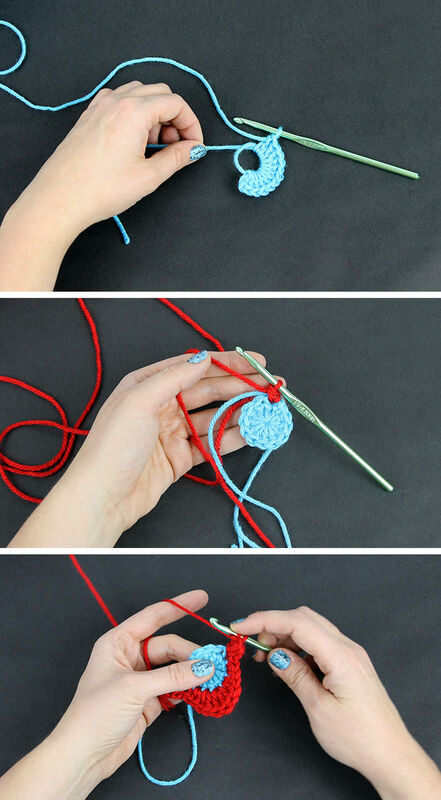 Use the yarn needle to thread a bead or two onto the top of the tassel. Tie onto the bottom of the ornament and cut off excess. 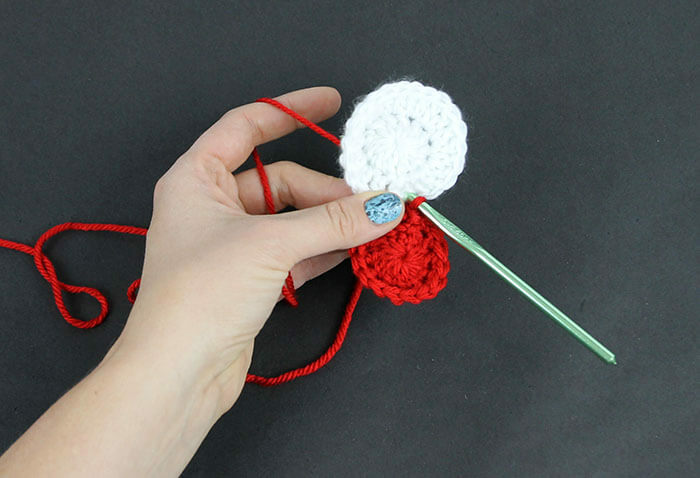 For this ornament, you will crochet three circles and stitch them together. Round 1: Start with magic loop, ch 3, 11 dc in magic loop, pull to tighten, sl st to join. Round 2: Ch 3, dc in same st, 2 dc in each st around, sl st to join. Finish off, weave in ends. Round 2: Ch 1, sc in same st, sc, 2 sc, * sc, sc, 2 sc, repeat from * twice, sl st to join. Do not finish off. Using the same yarn, crochet through the bottom two stitches of circle one. When the two circles are securely attached, finish off and weave in ends. Round 1: Start with magic loop, ch 3, 11 dc in magic loop, pull to tighten, sl st to join. Stitch through bottom two stitches of Circle 2. Finish off, weave in ends. And that’s it for Ornament 2! Round 3: Join new color, ch 1, sc in same st, sc in each of next 6 stitches, hdc, (hdc, dc), (htrc, trc, htrc), (dc, hdc), hdc, sc in each of next 7 sts, hdc, (hdc, dc), (htrc, trc, htrc), (dc, hdc), hdc, sl st to join. Finish off, weave in ends. I added a tassel to the bottom of this ornament as well following the same process used for ornament one. 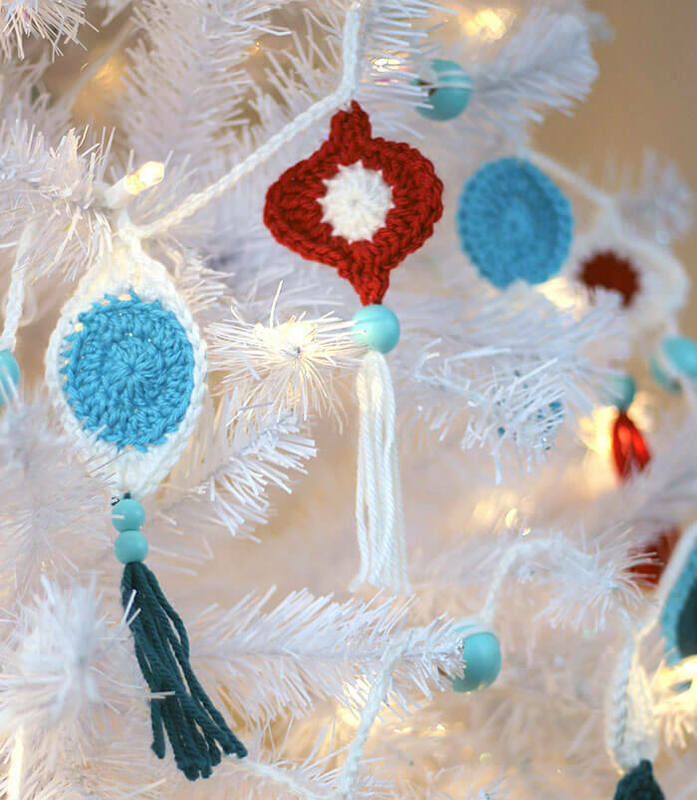 When you have a little pile of ornaments, string them onto a length of yarn or tie them onto a long string of chains. I also added large wooden beads in between each of the ornaments on my garland. 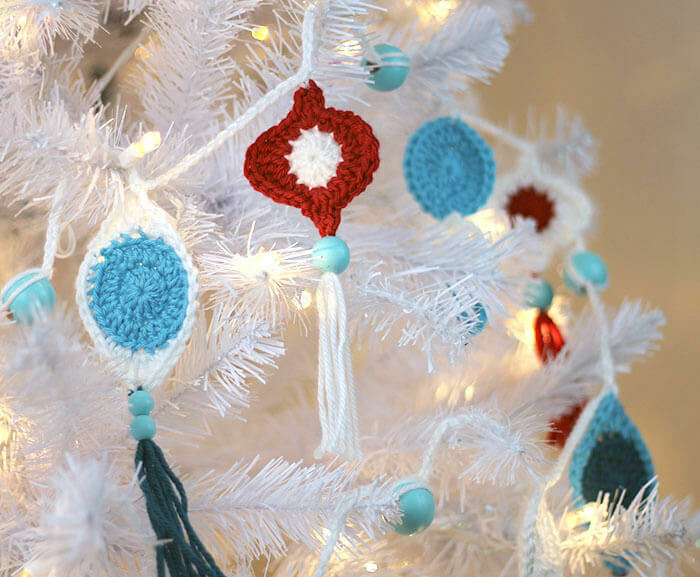 I really love the contrast of the glossy wood beads with the crochet ornaments. 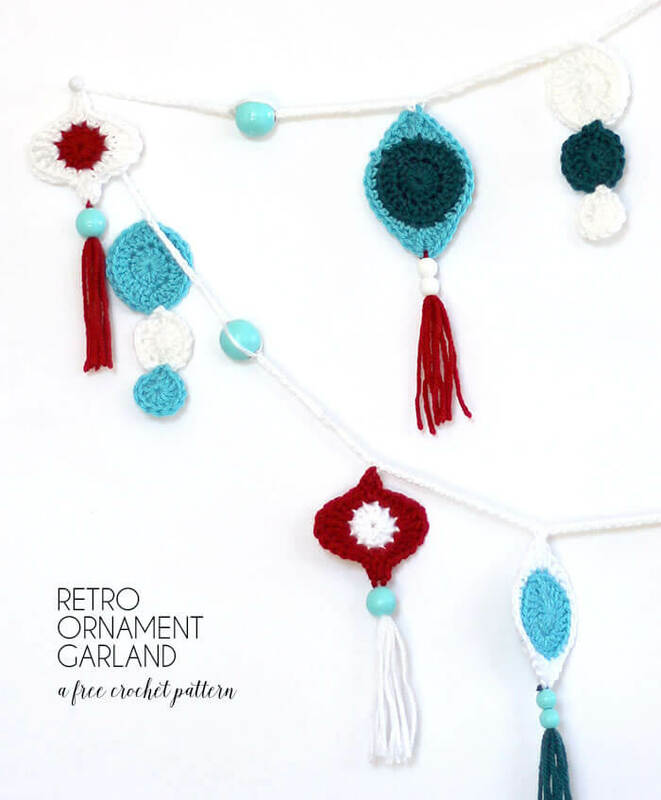 Be sure to hop around to all the other great garland patterns! They will be going up throughout the week, so check back to get them all! 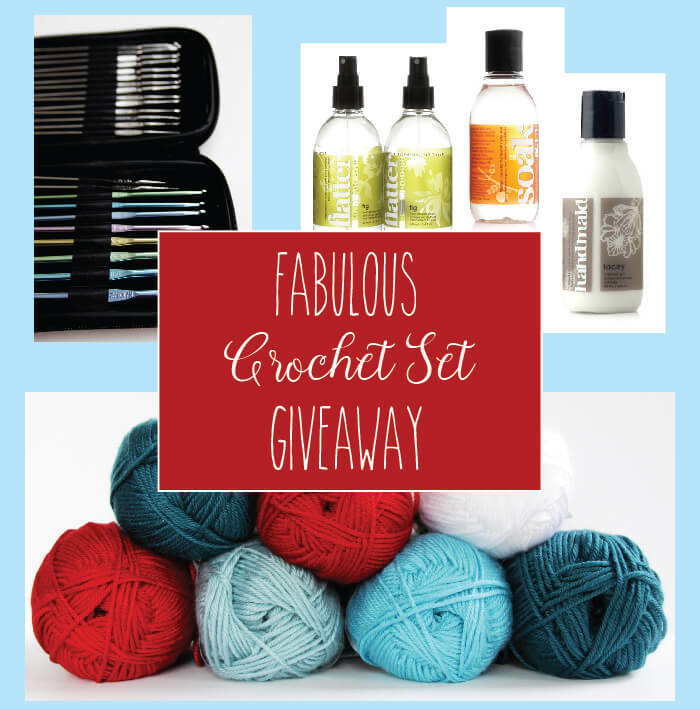 Now who wants to win some awesome crocheting goodies? Good luck! A Crochet Master Set from Boye – a pink zipper case full of hooks! A Yarn Assortment (8 skeins) – plenty of yarn to make any garland in our blog hop! Enter the giveaway in the widget below. Good luck! I love your garland! I am going to start on in tonight! The colours do fit into a great retro vibe and goes with the rest of my Christmas decos. Oh yay! Love to hear that. 🙂 Happy Crocheting! 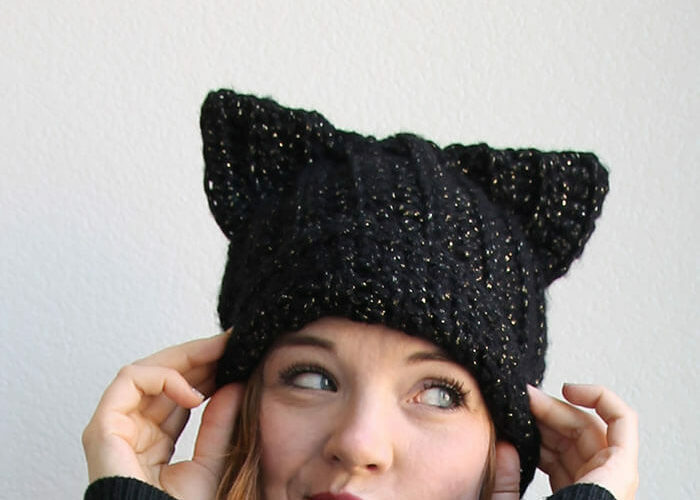 I love making hats and coffee cozies for the holidays! 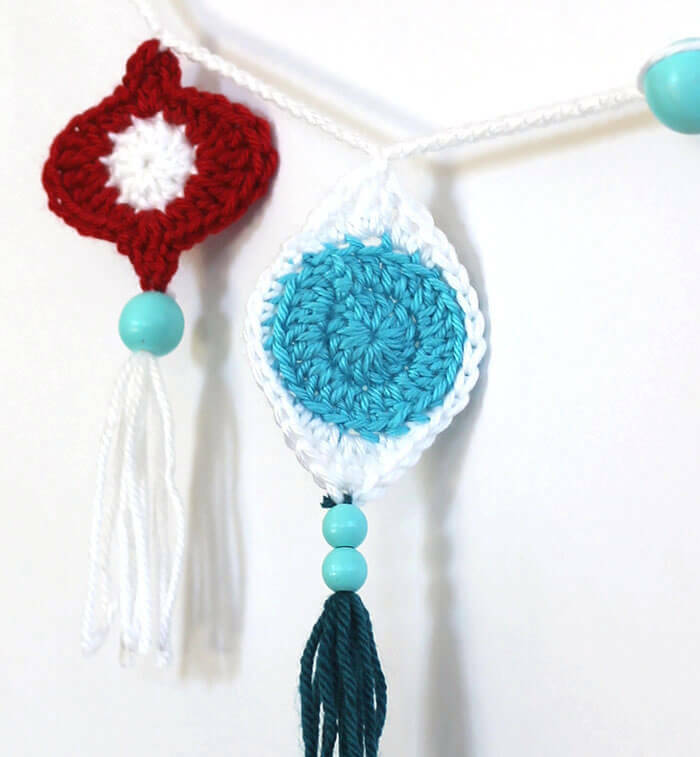 I love to crochet ornaments! This garland is so cool! 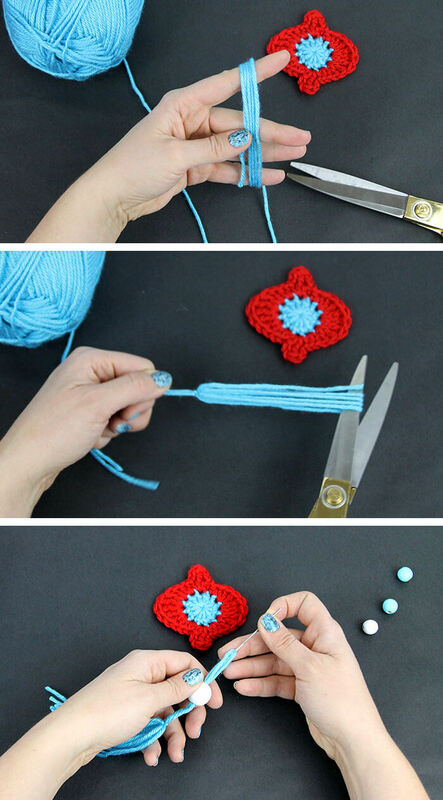 My sister would love this – she can crochet and loves all things retro. I’m sending her a link now! I love to crochet hats and scarves, grat gifts for my family. This year I’m crocheting blankets for everyone. Working on the last one now. That garland is adorable! And my favorite color combination! Your patterns are so well written and so easy to follow! I appreciate that! Thanks! This is great! You should do a YouTube video. I am terrible at reading patterns! I would definitely subscribe to your channel. Hi Noelle! That’s something I’ve been wanting to get into. I am planning on it. Thank you!